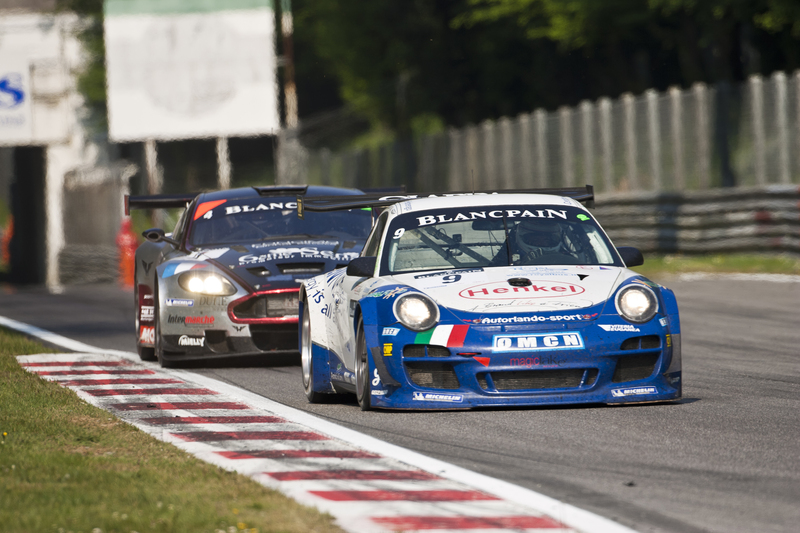 The first ever Blancpain Endurance Series race at Monza was a huge success with Italian team AutOrlando Sport, driven by Paolo Rubeti, taking the chequered flag in front of their home crowd. The Porsche only had to complete two stops, the their nearest rivals three, and this gave the team the advantage and Ruberti was joined by Gianluca Roda and Raffaele Gianmaria on the top step of the podium. THe second placed car was the nr32 Belgian Audi Club Audi R8 LMS of Stephane Ortelli, Bert Longin and Filipe Albuquerqe finished 58 second behind the Porsche but led the race before the splash and dash pitstop 10 laps from home. 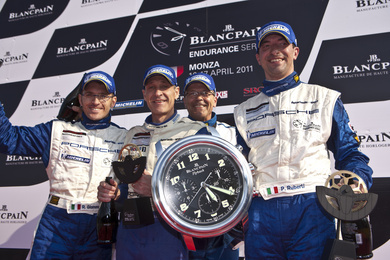 An early puncture also delayed the Audi but they fought back to claim a podium place in the first race of the season. The Marc VDS Ford GT of Bas Leinders, Maxime Martin and Markus Palttala was third. The class winners were Marc A Hayek and Peter Kox in the Blancpain-Reiter Lamborghini (GT3 Pro-Am Cup), with Hayek bringing the car home in 4th overall. Georges Cabannes and Gregory Guilvert were the GT3 Citiation Cup winners in the Ruffier Racing Lamborghini Gallardo and the GT4 Cup was won by the Lotus Italia team with Edoardo Piscopo, Leo Mansell and Greg Mansell holding off the challenge of the RJN Motorsport Nissan to claim the first GT4 Class win of the new series. The 33 car field looked a magnificent sight in the Italian sunshine as they approach the start finish line for the rolling start and as the lights flashed to green over 16000 horsepower was unleashed as the grid powered down to the first corner with pole position holder Andrea Invernizzi, in the Black Bull Swiss Racing Ferrari being passed by several cars, with Andrea Piccini in the nr33 Belgian Audi Club Audi R8 getting into the corner first. At the end of the first lap it was the Audi from the Marc VDS Ford of Markus Palttala and the nr4 Hexis Aston Martin of Henri Moser. However it was the nr3 Hexis Aston Martin of Yann Clairay that was on a charge, passing Moser’s Aston and then Palttala’s Ford in quick succession to take the fight to the leading Audi, which the Frenchman succeeded in doing on lap 4 at Turn 6. Another driver on the move was Stephane Ortelli in the nr32 Belgian Audi Club Audi R8 and by lap 7 had moved into 2nd place ahead of his teammate to take the challenge to Clairay’s Aston Martin. Further back in the GT4 battle the Lotus Evora of Edoardo Piscopo was having a battle for the class lead with the RJN Nissan of Jordan Tresson, and several swaaping of places ended with the Lotus getting the upper hand for a few laps. On lap 11 the AF Corse Ferrari 458 and the nr 42 Sport Garage Ferrari 430 both ended up in the barriers at the Ascari Chicane thanks to some oil dropped on the track. On lap 23 the nr33 Audi suffered a puncture to the left rear tyre and had to limp back to the pits for fuel, tyres and driver change. Four laps later the same thing happened to their teammates, with Ortelli slowly returning to the pits to hand over to Bert Longin. At this time the first round of pitstops began and once completed the nr20 SOFREV ASP Ferrari 458 was leading the race after a quick pitstop but it proved to be too quick as the car had to return to the pits again for a second stop and driver change. Pierre-Brice Mena now led the race in the nr3 Hexis Aston Martin DBRS9 from the nr40 Marc VDS Ford of Bas Leinders and the nr1 Vita4One Ferrari. The Leinder’s Ford suffered the same fate as the Belgian Audi Club cars when a tyre blew out on lap 19 and had to return to the pits for a replacement promoting Nico Verdonck in the Vita4One Ferrari into second. The second round of pitstops came round in the second hour and Mena’s leading Aston Martin could be seen to be struggling with grip, with smoke coming from the front of the car. On lap 54 he came into the pits but smoke started to billow from under the bonnet when a heat exchanger failed and the resulting fire had to be extinguished by the mechanics. 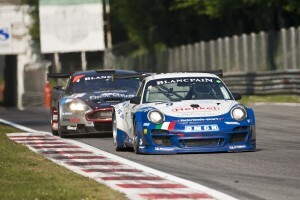 The nr9 AutOrlando Porsche was now leading the race with Raffaele Gianmaria at the wheel until the car’s final stop on lap 63. In the Pro-Am Cup Peter Kox had brought the Blancpain-Reiter Lamborghini into 4th place and handed the car over to Marc A Hayek for the final stint in the class lead and 5th overall. In GT4 the nr70 Lotus was leading the class after a puncture had forced the RJN Nissan to head to the pits and the nr31 Ruffier Racing Lamborghini of Gregory Guilvert held a healthy lead in the GT3 Citation Cup over the nearest class rival. Meanwhile back at the front of the field the nr 32 Audi was powering up the field, passing the Marc VDS Ford and reeling in the leading Porsche until Maxime Martin was able to take the lead on lap 75 on the run into T4. However the team’s joy was short lived as the Audi had to come in for a quick splash of fuel and to change the rear left tyre before rejoining the battle. The Marc VDS Ford GT had to complete the same manoeuvre on lap 81 leaving Paolo Ruberti with a healthy lead of over 1 minute in the AutOrlando Sport Porsche. Fred Makowiecki, now at the controls of the nr4 Hexis Aston Martin was running well but disaster struck on lap 89 when the car went straight on at the Parabolica and hit the tyre wall, his race completed while lying in a podium finishing place. The AutOrlando Porsche maintained the healthy gap to the second placed Audi R8 and Paolo Ruberti held on to his advantage until the chequered flag was shown on lap 94. The next round of the Blancpain Endurance Series will be held at Navarra in Northern Spain on Sunday 22 May 2011 with more cars expected to join the large grid.